June 14, 2013, 10:31 AM · We know that Star Wars Land is happening at Disney's Hollywood Studios. But what we don't know yet is exactly where the new land will be set. Of course, if someone associated with the project would like to leak us a copy or description of the plans, we're at themeparkinsider@gmail.com. Until that happens, though, let's talk about the setting of Star Wars Land. Not the physical setting: where the land will be built in the park. Let's talk about the thematic setting, because Star Wars Land provides what might be the greatest placemaking challenge in recent theme park history. Harry Potter was easy. Build Hogwarts Castle in the town of Hogsmeade -- almost all of the action in the seven books and eight movies takes place there. Star Wars plays across an entire universe, however. How do you decide which of the multiple planets that have hosted Star Wars stories should provide the setting for Disney's Star Wars Land? And if one were to choose to place the land on multiple planets, how would one logically explain guest movement between the different planetary settings? Disney's current Star Tours ride never addresses the location of its Star Tours terminal. But the ride makes clear that there are multiple planetary destinations in the Star Wars universe beyond its setting. Given that Star Tours ought to be part of Star Tours Land, how would the ride's inclusion affect a decision about the land's setting? Let's assume that the setting will be a planet, and not on a Death Star or other spaceship, which would necessitate building a much more-expensive all-indoor land. The top two choices, given the action of the first six films, would appear to be the Skywalkers' home planet of Tatooine, or the Republic/Imperial Capital of Coruscant. Yet, other planets surely will appear in the new Star Wars movies Disney is beginning to produce and will be eager to promote to its millions of theme park visitors. Perhaps the land's setting should be one of them? It's vote of the week time. If you voted for another planet, please use the comments to tell us your specific suggestion. If you voted for multiple planets, we'd love to hear your suggestions on how Disney could handle the transition between those settings. Finally, welcome to all our new readers this week, and thank you to all of our readers for being part of Theme Park Insider. Our reporting on Disney's Star Wars Land really heated up as a result of conversations on our Twitter feed. If you're not already following Theme Park Insider on Twitter, please consider this your invitation to join us over there, too! The multiple planet route would be the best IMO. Tatooine is a desert planet, covered in sand. As Anakin Skywalker once awkwardly proclaimed, I don't like sand. I don't want to get it in my shoes, and I don't want to get any in my eyes if the wind picks up. Sure, they could cover the ground with a rocky surface that looks sandy, but it's not really the same. Coruscant is a planet that has been completely enveloped by a city. A city that has progressively grown taller, blocking out all sunlight from the lower levels of the city. Coruscant would be very hard to accurately depict. I can't see them being able to give us the sense of depth required. I definitely don't want to see it as a Star Wars movie set, because most of the prequels were shot in front of a green screen instead of a set. I'd like to see a few diverse elements; maybe we get Mos Eisley and the cantina, the Jedi temple on Coruscant, the Ewok village on Endor (I know, it's a moon, not a planet). One thing I'm sure of is that if they can do Blizzard Beach, then they can do Hoth. I also seem to recall hearing that the woodsy area behind the park is kind of swampy. You know what that means, Degobah! I voted for multiple planets and would like to see Naboo/Tattooine/Coruscant with the Coruscant portion including the Jedi academy or something of that nature. If this theme park is to be in Orlando, then Hoth is out! I would say Tatooine as a weather would be a little closer, but our tropical landscape in Orlando is hardly desert-like. Coruscant is all city, and I think that would be a wee bit boring and you wouldn't really feel immersed in "Star Wars" per say. Dagobah seems soggy and tropical but perhaps a little TOO moist! I vote for Naboo, which seems nice, picturesque and warm! If they decided on multiple planets, I'd be ok with that too. It kinda gives you a taste of everything. In the other article about this rumour someone suggested a separate part for DHS like World Showcase and put all those different planet locations around a lake. That would be awesome and actually the only right thing to do. You would be immersed in these different environments. Have at least 3 major e-tickets and other planets with C or D rides and a nice parade each afternoon. The rest will be shops, restaurants, shows, etc. The night end with a firework show with the Don Williams music. It seems to me Star Tours is set on Endor. I like continuing with Endor. Going to need a setting that will offer some shade. Treeless desert would not work. It is Florida after all. 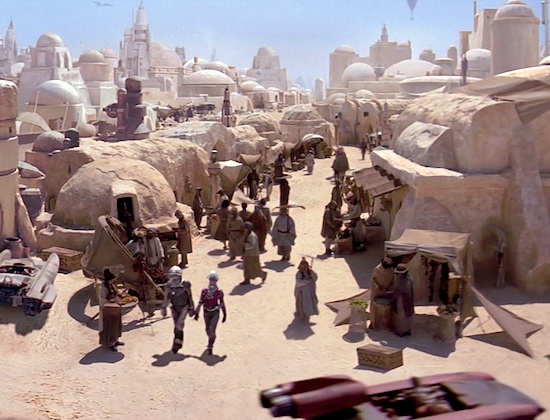 I would use obvious choice of Tatooine for the Cantina QSR and the shopping areas, one of course would be Watto's Shop. Coruscant would be used for the interactive section with character meet and greets, perfect place for a new attraction, etc. Of course you could use the Yavin 4, Kashyyyk, or Endor planets for a kiddie section to re-use the Honey I Shrunk the Kids play-zone. My first choice is Tatooine especially since Carsland will be built in the same area. It is quite easy to blend the Arizona desert landscape with the Tatooine desert landscape, the famous Cantina, the place where Luke and Leia were rescued from Jabba The Hut, and the Pod races; however, I don't think only one planet should be represented. At least another planet should be featured like where the Jedi Council Chamber met on Coruscant, but perhaps a trip to the Death Star is my second choice. I voted for Tatooine. It's relatively easy to pull off and easily identified. But Robert, you're missing the most important question. "Will they serve Blue Milk?" After all, new theme parks lands need a signature drink. I would love to see Naboo. A bunch of green-domed buildings with what looks like mostly Roman-style architecture and various foliage. Of course, they already have two planets represented. The Ewok planet near the front of the ride where the AT-AT is, and what I guess is Mos Espa at the store, which is all sun-drenched rock. Simply extend each section in the direction its facing and there would be no need for any changes to what already exists, while giving a nice transition area right at the Star Tours ride. But one of the reasons I love Harry Potter land so much is that it's a huge area all in the same theme. Having two+ planets represented could make for two small lands, neither of which would be as immersive as if one planet was used for the entire land. And though the particular planet will likely never be agreed upon by everyone, it will look better. Multiple planets would be cool. If they go with one, go with Tatooine. Definitely the most recognizable. Tatooine would likely make for a more seamless transition from Radiator Springs. I'd be surprised if that factor hasn't crossed their minds. I'd say go with another Star Wars planet, either the Endor Moon, Yavin IV, or Dagobah. Cars Land will already be desert-themed so that makes Tatooine a little redundant, and Coruscant is just urban sprawl so that might not be very scenic. And I just can't think of any good way of having an adequate transition between multiple planets short of an actual moving transportation attracting taking you between one location and the next a la Diagon Ally/Hogsmead. And that's not very feasible with the space they have. Star Wars needs its own park to do it truly properly with multiple planets. This is the way I'd do it. Star Wars is too big for just one land of a park. A whole Star Wars park could work, but this doesn't seem like the avenue they've chosen. Therefore multiple themed areas must be the go. They could all be in the one park, but it makes much better commercial sense to spread them across the parks, like Harry Potter has. A post on another thread detailed this and I think that poster had some good ideas. For DHS I would go with Tatooine. I would personally extend out over or under the road with the bridge being decorated as the transition into Mos Eisley, and converting the swampland into tattoine (knocking down things would probably make more financial sense I admit). Star Tours could have a rethemed exit so the ride is the thematic access route to tatooine from earth. The next ride would be on Luke's t-16, definitely a kiddie coaster (I don't believe DHS has one at all) with a simple threading of the stone needle and taking potshots at womp rats. The final ride, and the e-ticket,would be a pod-race. This could be done in many different ways, and I'm sure disney's imagineers could come up with better ideas than I could on how it works. This is one of the best action set-pieces from Tatooine, and could make for an incredible ride if done correctly. Please let me know what you think of my ideas. Another route would be to make an interior location, such as the inside of the Death Star, etc. Those could be rather large areas and could possibly encompass a dark coaster/ride. I'd love to see mini lands spread out between all 4 parks. Hollywood Studios - They've already established Endor, it could easily be expanded into Muppets area. Turn Pizza Planet into Ewok Eatery, lots of food on a stick. And Muppets 3D can be rethemed, Keep Star Tours as is. Epcot - Coruscant can be done up in the area of Ellen's energy adventure. Mission Space can be re-themed. And a small c-ticket attraction can be done. The area shouod be in a similar style of the world showcase, they can have nightclubs / bar / counter service etc. magic Kingdom - Naboo. I think this could fit perfectly between tomorrow land and New Fantasyland. They can take out the racing ride, and convert that whole area into naboo, have one d ticket attraction involving an attack by the federation or they could bring back the submarines and theme it to the gungan world. I love Cloud City...I think that would rock, or Endor. And forget the pod races! I would much rather race through some redwoods! Okay - how many of you have been to New Fantasyland? It's cool and all, but the transitions are not what I would call "seamless" or "natural" which I would hate to see happen to SWL. Oh, and because it needs to be said - forget SWL and CL. Just get rid of the Indy show and replace it with the Indy ride already! Such a no brainer!!! There is no use for me in any kind of Star Wars land without being able to travel to and explore the Death Star as a real, physical place. For me, this is the most iconic and important location for the whole shebang. I'm voting for as a movie set. Only for the trolling joke that Jar Jar is the tour guide. This is my idea. I thought it up with my family this week: use the EPCOT model and create the Star Wars planets like pavilions in a Galactic Showcase. You can theme this by saying that each of the planets has setup a pavilion to teach people about the planet, like the countries of Earth did at EPCOT. This way you could have all kinds of planets there. * Tatooine (with Mos Eisley cantina) and a speeder chase E-ticket ride through the mountain canyons; my idea is to take the Radiator Springs Racers ride from DCA and clone it at DHS...but don't theme it to Cars. Instead, theme it to Star Wars and you could have sand people shooting at you, those Bantha and Dewback creatures, and other things. I also think you could have Jabba's Palace too...and have that be a theater where shows could be put on...and it would have animatronic Jabba on a balcony watching the show with you! * Coruscant (this is the city-planet)...I think this could have a really fancy and elegant restaurant that would rival Le Cellier because Coruscant is the capital of the whole universe! I think it could also have a ride where you are flying around and zipping and zooming past the skyscrapers and then down into the dark reaches of all those buildings! I also think it would be fun to have a "Galactic Zoo" dark ride that would take guests past a collection of animals from the Star Wars movies. This would be a fun ride for Animal Kingdom too, if Avatar wasn't going there. * Dagobah (the swamp planet where Yoda lived)...would make a great place for a spooky dark ride. Remember when Luke had to be tested and Yoda was telling him about The Force and he had to fight that ghost Darth Vader in the Empire Strikes Back? That would make a great dark ride. * Hoth (the ice planet)...Disney can make Sea World's Antarctic look very junky by building the Ice Planet of Hoth...and I think the ride here would be set inside the rebel base and there would be those animatronic TaunTaun creatures and you'd maybe have a dark ride that would have that Wampa monster trying to womp on you!!! Would make a great place for an ice cream parlor too, built to look like it was carved out of the ice. * Endor (the forest planet)...I see this as maybe a children's play area, running along rope-like paths like Grizzly Trail at DCA...only theme to be in the redwood forest of Endor's green moon. That's where those adorable little Ewoks were all living. * Naboo (where Queen Amidala lived and it all looked super elegant). The architecture is so beautiful here...but I can't think of a good ride. You know what would be fun though? What if they themed the whole showcase like it was Naboo, next to a lake, and the Pavilions could all be on Naboo...so Naboo would be the host planet and then all the other planets would be represented by pavilions. * Bespin (this is where Cloud City is and where Lando Calrissian lived). I think this could be a really exciting ride that maybe could be like Soarin'. * Alderaan (that's the planet where Princess Leia was from and it got blown up by the Death Star). I think there could be a ride here that's set as the Death Star is attacking. For many years I wondered what Alderaan looked like...so I would like to visit there. They showed it briefly in the Revenge of the Sith movie at the end...it looks like Slovenia there, with futuristic buildings. * Mon Calamari (that's a water planet that will be featured in the next trilogy). This is where that Admiral Akbar is from. Could be a good excuse to have a really good underwater-feeling ride. This is exciting to think about all the possibilities! I think a world showcase setup that is themed as if you are on Naboo would be the easiest way to represent all of these planets...just like at EPCOT with the countries. 3) Death Star interior--Guests will love being in a mock-up of a colossal mechanical space station with Klaxons blaring and panicked Cast Members running around as the Death Star is about to blow up. Talk about something going horribly wrong! 4) Endor moon--Disney will spare no cost and transplant a redwood grove in Florida and hire an army of Hollywood extras to work in costume as Ewoks. Main attraction should be speeder bikes coaster in Endor. High speed steeplechase! I'd like to see just about any attraction or setting. But we *don't* "know that Star Wars Land is happening at Disney's Hollywood Studios". None of the higher-placed CMs I know at WDW have heard anything close to official, just guest speculation getting spread by front-line CMs and all say a variation of the same thing; Disney is investing far too much into Pandora and Disney Springs to spend on any other expansions at WDW for the foreseeable future. While I hope very much to see Star Wars Land (And CarsLand East), I just can't get any excitement out of year-old recirculated rumours until I see anything official from Disney. After all, most of these same sources were the ones claiming Bob Iger and George Lucas were at DHS on May 4th to announce Star Wars Land. That didn't happen either. "After all, most of these same sources were the ones claiming Bob Iger and George Lucas were at DHS on May 4th to announce Star Wars Land. That didn't happen either." True, but Robert Niles has a pretty excellent track record when it comes to industry leaks (he seems to be the "official, un-official" conduit), at least as far as Universal and Harry Potter goes. In any case, I suspect we'll know either way at D23, since it would make no sense for Disney to use plans like a Star Wars world as a weapon against Universal and NOT go public as soon as possible. Use the STAR TOURS ride itself, as the logical hub. Enter from the currently themed Endor, ride the ride then have the last scene of the ride be in Tatooine. This would trigger a set of exit doors which would lead to a Tatooine themed planet. Another ending of the Star Tours ride might be the Death Star. When the Death Star ending occurs different exit doors open, walk down a long airport like corridor and you are now on the Death Star. In each of these "planets," there would be a Star Tours spaceship terminal which would allow you to return to the ride, via a long airport like corridor, and take it to another location. You could even have designated motion simulators, the 2 on the left go to Tatooine, the two on the right visit Hoth, the center ones are shuttles to the Death Star. Each would have their own separate exit into a differently themed planet. The Star Wars universe is difficult to recreate. If they create an immersive 'Star Wars Universe' with multiple planets, in a theme park industry where you can travel via Hogwarts Express from Hogwarts to London, how would we logically travel from planet to planet? Precedent set by the competition matters. I they were smart they would theme the back side of Radiator springs racers, so that Tatooine would have a nice rocky back drop. The themes would blend very well. I'm all for Korriban, the Sith homeworld, as it's full of tombs for the young ones to explore. Both kids and parents agree: Give us Endor, Hoth, and Dagobah. It would be awesome to have the Mos Eisley Cantina for a restaurant. My 8 year old son also wants there to be a Death Star.